Wait! Don’t go! I know the title of this post is all kinds of boring and probably has you yawning right out of the gate. Either that or you want to scurry away shrieking. But hang in there for just a moment while I persuade you that the contents of this post will cause you to have a more fun life, not a less fun life. The fact is that getting the important things done routinely just makes everything else in life better, where important things = things that actively improve your health and wellness, stress levels, and general wellbeing. Or put another way, important things are things which if you do not do them consistently result in declining health and wellness, increasing stress levels, and a reduction in your overall wellbeing. It’s just like getting your car in for routine maintenance. Give yourself the same care and attention. You will find you are able to enjoy a lot more of the fun and interesting things in life and have more time to do it, all in exchange for a tiny bit of time doing a few routines. Trust me on this one. Routines allow you to be a lot more spontaneous the rest of the time. 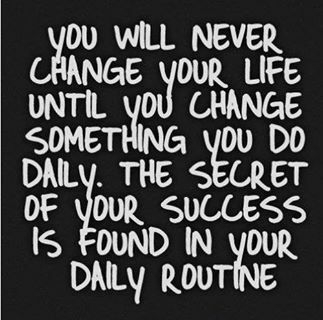 What routines really do is ensure you are consistent with things that are important to you, and consistency is absolutely key to lasting and effective change. Being consistent allows you to monitor your progress effectively, and ultimately, consistency is often the difference between failure and success. Routines help stop you getting overwhelmed and stressed. And that means you get to enjoy more of life’s excitement. Here are some of the things that I have routinized as a result of my recent transformation that I have found make a significant difference in my life, in no particular order. This list is not exhaustive, but it will give you ideas for your own life. Supplements – every couple of weeks (but you can do whatever frequency works best for you) I get a pile of small Ziploc baggies and put a days-worth of supplements in each one. This means in the morning I can just grab a baggie and go without having to take the time to undo a multitude of bottles every day. Yes I could get up 5 minutes earlier to make sure I have time to take supplements, but a) I value my sleep more, b) it gives me one less thing to do as I start my day, and c) I never miss taking them. If you are interested in what supplements I take and missed that post you can read it here. Supplements – I take some with breakfast every morning and some with dinner every night. I put the morning baggie next to my smoothie and the evening baggie in the middle of the counter so I can’t miss it at dinner time. If you are not consistent with supplementation you may as well not take them at all. Green tea and breakfast smoothie – the first thing that I do when I walk into the kitchen every morning is put fresh water in the kettle and switch it on so I can brew a big mug of green tea with peppermint. Ok, yes, I do put the lights on before that. Once the kettle is heating I get the vitamix out and whip up my breakfast smoothie. If I allow myself to get distracted before I have done these two things I know that the chances of them getting made go down exponentially as the minutes tick by. This gets me 6 servings of non-starchy veggies, a healthy dose of protein and all that fantastical green tea down the hatch within 15 minutes of being awake. Eccentric exercise and interval training – for the eccentrics I decided which day and time would consistently work best with my schedule to go to the gym, set a recurring appointment in my calendar, and made a commitment that no-matter-what I would go. Same thing for interval training only I do it at home. This keeps my fat-burning hormones switched on and my muscles strong – all for 25 minutes of routine a week. Bargain! Yoga – I found a class at a time that I could commit to every week, set a recurring appointment in my calendar, and made a commitment that no-matter-what I would go. This 75 minutes a week benefits my life enormously. Sleep – I go to bed at the same time every night and set my alarm for the same time every morning. Give or take the odd time I have to be somewhere super-early. Our bodies love routine and consistency – especially when it comes to sleep. An hour before bedtime I start my nightly routine so my brain and body know that I am winding down to sleep time. Read this post on sleep if you want to know why it’s so important and how to get better at it. Eating SANE – I go to the grocery store every 4 days to get fresh spinach for my smoothies so I make sure I get everything else that I need during those trips. I keep a running list of things I need on my phone so every time I go I know exactly what I need. I save so much time and frustration doing this because I rarely run out of anything. Not running out of anything means I am far more likely to stay on the *SANE path – I don’t have to do emergency runs to the grocery store which gives more opportunities to be waylaid by *inSANE stuff. Eating SANE – once a month I get online for the things I don’t get at the grocery store. I schedule a recurring appointment in my calendar to do it. I order anything that I am getting low on, such as egg white powder, supplements, pork rinds, whey powder, thick coconut milk, almond flour, etc. This means I don’t run out of anything, plus saves me money by buying in bulk to boot. Rejuvenation – relaxation, R ‘n’ R, call it what you will, but don’t forget to build some into your life. Set up routines if that’s the way to make sure you get it in there. It is so easy to get on the treadmill of life and become consumed with working or otherwise doing all the time. I find that scheduling time to curl up on the couch and read a book makes it much more likely to happen. Schedule walks, schedule trips to the movies, schedule time with friends. Even knowing that I have time set aside specifically to get some R ‘n’ R makes me feel less stressed. When your brain and body know there is a break coming, you can be more productive in the moment. Sometimes I will block an entire day out for doing nothing. When the day arrives I can do whatever I want as long as it doesn’t look like work or housework. I should mention that having been a workaholic my entire life I am still a work in progress on this one. I struggle with the notion of not being productive in the traditional sense every waking minute of every single day. I am getting better. And it’s awesome. Finances – I check the online balances for my checking and credit card accounts every morning. It takes me 2 minutes, but if there is an erroneous debit or some other funky goings-on on any account I can stop anything bad happening immediately. This 2 minutes a day has saved me an enormous amount of stress and money over the years. Finances – I schedule an hour at the beginning of every month to reconcile all the financial activity for the previous month including gathering all documentation required at tax-filing time, and entering my business income and expenses in a spreadsheet. This saves me DAYS of time, frustration, and worry at tax time the next year. Walking with my BFF – instead of randomly scheduling time for coffee which inevitably turned into months going by without seeing each other, we scheduled a recurring appointment every week to walk to the coffee shop, drink green tea, and walk back again. That gives us 50 minutes of healthy walking and a total of 2 hours of restorative, supportive, happy chat time. It has become our favorite 2 hours of the week. My BFF will tell you that routinizing this one thing has transformed her life. It is amazing what 2 hours of support, and love, and laughter a week can do for you. The Big Breakfast Adventure – every Sunday I schedule to meet someone somewhere for breakfast. It gets me out of the house, provides me with new experiences, gives me time with people I love and enjoy, and has someone else doing the cooking for a change; all of which fuels my creativity, brings me joy, quietens my mind, and uplifts me. 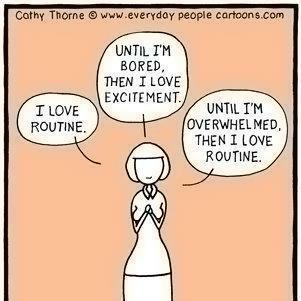 If I didn’t have it set as a routine I would probably only think to go twice a year. The benefits are worthy of way more than twice a year. Backups – as well as the cloud backup I have running constantly in the background, once a month I backup all my data, images, and websites to several different removable hard drives which I store offsite. This simple monthly routine has reduced my stress more than I can even explain. Figure out the things that are most important in keeping your life and health on track and then build a simple routine so they stay front and center. Think about the biggest stressors in your life and find routines that lower that stress to a minimum, or stop it altogether. Then you can go out to play!